The presence or absence of collisions between volcanic arcs and continents in the tropics set long-term trends in Earth’s climate, according to new research. For the entire history of our species, humans have lived on a planet with a a chunk of ice capping each pole. But Earth has been ice-free for about 75 percent of the time since complex life first appeared. This variation in background climate, between partly glaciated and ice-free, has puzzled geologists for decades. 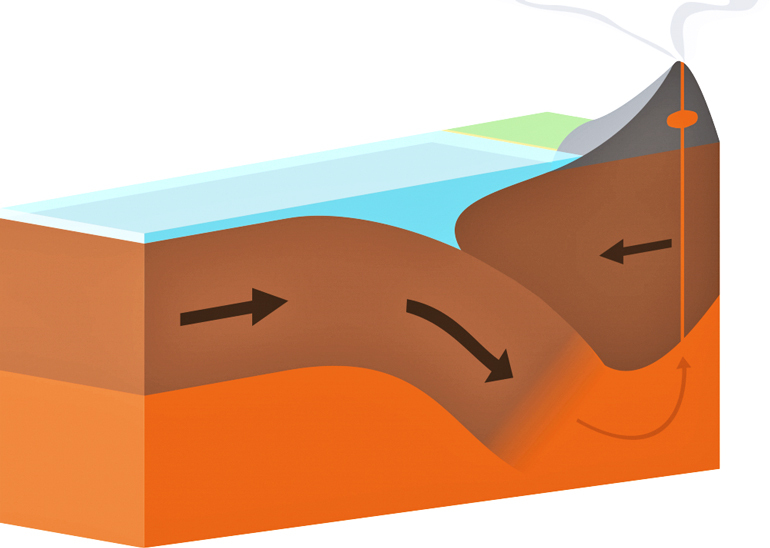 Now, researchers report in Science that tectonic activity may be the culprit. “There’ve been a few hypotheses but no agreements as to why we have warmer or colder climates on these very long timescales,” says Francis Macdonald, a professor in the earth science department at the University of California, Santa Barbara. On any scale, though, the primary agent of climate change is carbon dioxide (CO2). The question is what factors influence the amount of CO2 in atmosphere. Some processes produce CO2, while others absorb it. Scientists call these sources and sinks. The debate among geologists is whether sources or sinks affect the climate more. “Some have argued that CO2 sources, like volcanism, have driven climate change on long timescales, while others have argued that, no, it’s the sinks that have caused climate change on these timescales,” says Macdonald. Rock type also plays a key role. Stone rich in iron and magnesium has simpler chemical bonds that break down more easily. This makes these mafic rocks, like basalt, better carbon sinks than rocks such as granite, which have more complex bonds. Plate tectonics is what drives this geologic carbon cycle. When one tectonic plate slides under another—usually a dense ocean plate under a continent—the melting rock fuels a row of volcanoes on the top plate called a volcanic arc. The Cascade Range of the Pacific Northwest is one example of this. “The tropics are where the rocks weather best because it’s the warmest and wettest,” explains coauthor Lorraine Lisiecki, an associate professor also in the earth science department. “Given how many things are changing on Earth at the same time, it’s amazing that it all came out really clean and matched so well,” says Lisiecki. The collisions have the added effect of shutting down volcanic arc activity, which cuts off that source of CO2. “But if it was a volcanic effect, it wouldn’t matter where the volcano was,” Lisiecki says. It’s only the weathering effect where latitude makes a difference. And the team found a much stronger relationship between the climate and collisions that happened in the tropics, rather than those that were outside the tropics. Macdonald embarked on this large compilation project after several of his colleagues had pushed back on results from studies with smaller scopes. “I thought, ‘You’re absolutely right. We need to look at this more broadly,’” he recalls. Now the team hopes this paper challenges their colleagues to make a more rigorous case for their own hypotheses. Macdonald and Lisiecki also know that this paper is not the last word. “The database is open,” Macdonald says, “so I’m hoping that this is an iterative project. And as more constraints come online, they can be entered and the model can be refined.” To that end, he is currently investigating how strong an effect rock type has on this hypothesis. Humans have lived for hundreds of thousands of years with little concept of the dramatic changes the planet has witnessed over the eons. Although the subjects it studies are ancient, modern geology developed relatively recently. The theory of plate tectonics, for example, was not widely accepted until the 1960s.